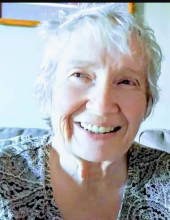 SANBORN, Gloria Ann -- Age 81 of Fenton, died January 12, 2019. Funeral Mass will be celebrated 11 AM Monday January 14 at St John the Evangelist Catholic Church, 600 N. Adelaide St., Fenton with Fr. David Harvey celebrant. Interment will follow at St John Cemetery, Fenton. Visitation will be 1PM - 5 PM and 7PM - 9PM on Sunday at Sharp Funeral Homes, Fenton Chapel, 1000 Silver Lake Rd., Fenton, where a Scripture Service will be held at 7PM Sunday. Visitation will also be held from 10AM until time of Mass at the church on Monday. Those desiring may make contributions to St. Vincent DePaul. Gloria was born December 10, 1937 in Flint Michigan the daughter of James and Kathryn Drummond. She married Gerald Thomas "Jerry" Sanborn, he preceded her in death on September 14, 2010 after 53 years of marriage. She graduated from Flint Northern High School. She received her degree in Nursing from Mott College in 1978. Gloria was then employed at St. Joseph/Genesys as an R.N. She was a member of St John Catholic Church. She was a member of the Catholic Council of Women, the St. John Knights of Columbus #7418 Auxiliary. She was a member of the St. John Choir, and a chairperson of the Apple Fest. Gloria enjoyed Gardening, camping and traveling. Gloria is survived by her children, Michael Sanborn of Linden, Ronald (Shawnette) Sanborn of Houghton Lake, Mary Kay (Fritz) Schwarz of Linden, Karen Swanson of Fenton, Daniel (Becky) Sanborn of Oakland Township, Janice (Daniel) Diehl of Falmouth, Audrey (Pete)Kaucheck of Fruitport, Rhonda (John) Connor of Lapeer; 16 grandchildren; 13 great grandchildren; brother, Douglas (Lisa) Drummond; many nieces and nephews. She was preceded in death by her parents and husband, Gerald. Tributes may be shared at www.sharpfuneralhomes.com. To send flowers or a remembrance gift to the family of Gloria Ann Sanborn, please visit our Tribute Store. "Email Address" would like to share the life celebration of Gloria Ann Sanborn. Click on the "link" to go to share a favorite memory or leave a condolence message for the family.